Poovalaikkudi lies in Pudukkottai-Ponnamaravathi route, nearly one and half kilometers from Vaiyapuri. The site is inaccessible as it lies in the midst of the barren land shrouded by thorny bushes and shrubs. One has to ride through the bushes or to walk on the one way track to reach the site.1 Thanks to ASI for laying a mud track and fencing the monument. Few low level hillocks and boulders are scattered around this uninhabited area and the rock cut shrine is scooped on a centrally lying hillock on its eastern precipice.2 It is the nucleus around which various structural shrines mushroomed in the later period. The temple complex consists of a rock-cut shrine with structural mandapas in the front, and three other structural shrines surrounding it. To its south lies the shrine for Goddess Sundaravalli and to its north on the summit of the rock boulder is the shrine of Subrahmanya facing east and on the north east lie the shrine of Bhairava facing south. A bas-relief sculpture of Ganesa is cut on the southern precipice of the central hillock. 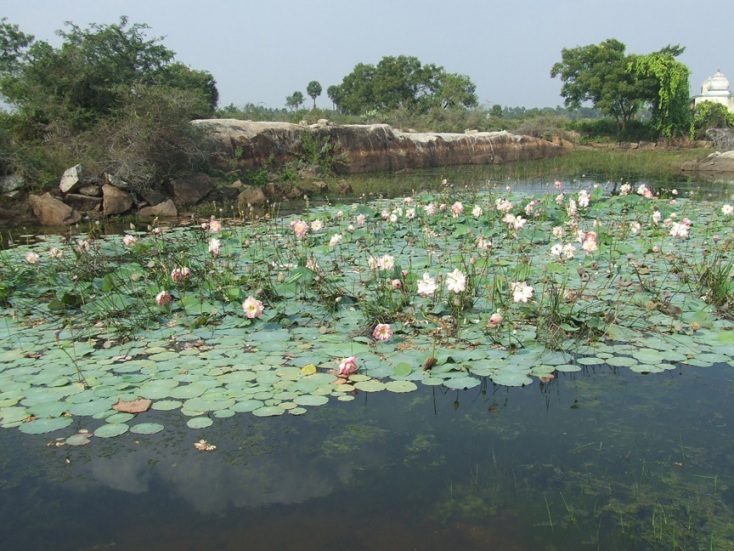 The rock-cut water tank found on the west and the lotus pond on the north add serenity to the place. The open pillared mandapa has in the front four rows of pillars with three in each row. The pillars are decorated as three squares with kattu in the middle. Idaikattu, nagabandhas are the other additional decorative features of the pillars. The potikas are angular with vettu. Stone slabs are arranged to form the roof of the mandapa and finished have cement plastering on the top. Some of the squares of the pillars are ornamented with miniatures and medallions. Inscriptions belonging to 16th century AD are found on some of the roof slabs, pillars, and potikas.4 In front of the open pillared mandapa is the nandi placed in a small mandapa facing the central shrine and a balitala. The front mandapa leads to the inner mandapas which consists of a maha mandapa and a mukha mandapa. The entrance to the maha mandapa is seen both on the south and the east. The inscription on the lintel of the eastern entrance speaks about the donor.5 Both the mandapas have a common wall structure with padabandha adhishthana, wall sectioned by brahmakanta pilasters. Vettu potikas above the pilasters hold the prastara. The roof is covered with stone slabs. The tala ends with bhumidesa. Inside, the pillars of the mandapas are with the components of three squares and kattu in between. 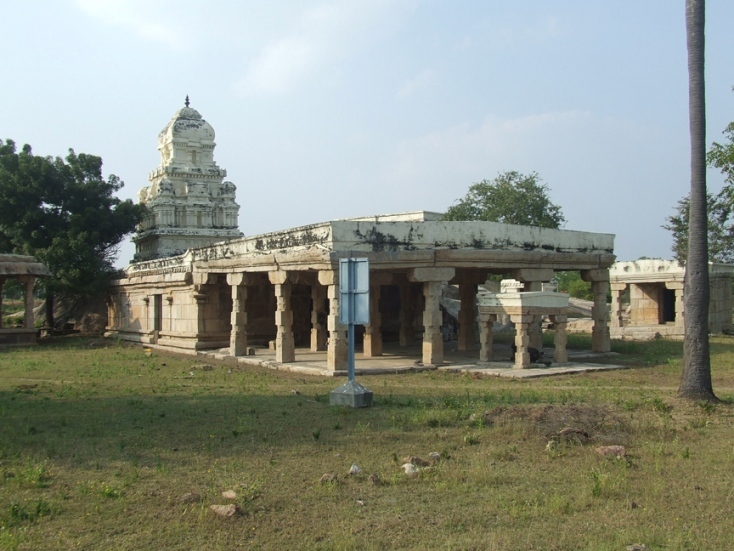 The potikas are vettu which extend it limbs to bear the prastara, stone slabs are arranged to cover the roof of the mandapa. The inscriptions on pillars, roof, potikas attests its existence in the 14th century A.D.6 On the northern side of the mandapa, the mother rock extends inside and forming part of the wall for few yards. The extended portion is sculpted as an pitha and formed as a platform with iron grill enclosure above it. On the southwestern edge of the platform a small rock cut linga is formed at its foot. On the north-west corner of the maha mandapa another platform is formed with closed provision where a small Ganesa is placed inside. 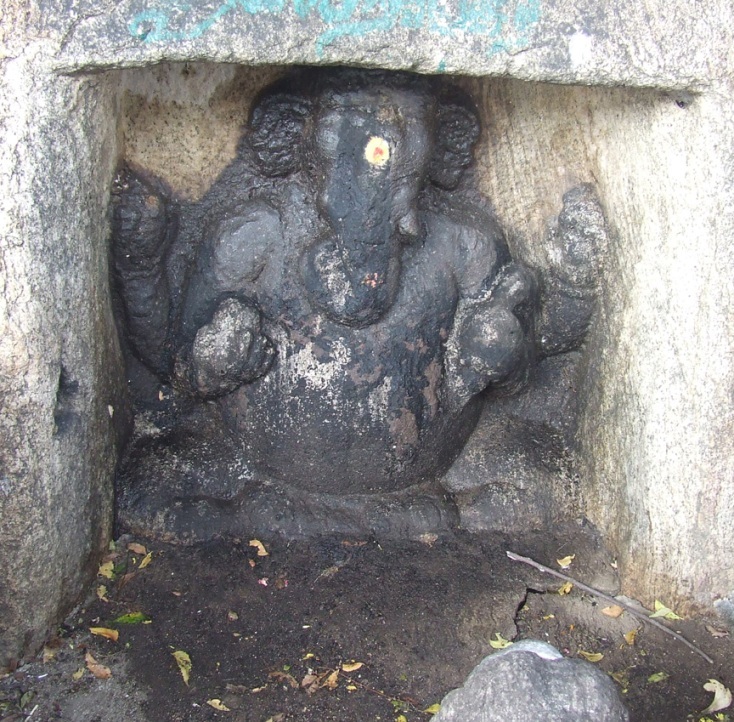 A sculpture of Ganesa is also seen near the entrance to the mukha mandapa. Adjoining the third row of pillars a structural wall sections the two mandapas where in its center the entrance to the mukha mandapa is formed. The jambs and the lintel of the entrance are decorated as padma petals and also possess inscription of the donor.7 Inside the mukha mandapa two pillars are seen. The roof slabs of the mandapa are rested on the mother rock above the kapota at a height of .58mts. The rock cut cave is a shrine cell with extension of mother rock as roof, floor and side walls in its front. Due to the sloppy and inclined nature of the mother rock the front extension is tapering upwards. The floor in front of the sanctum is .11mts above the mandapa floor and in its center the floor is cut as a pathway to the sanctum. The floor extension to the north of the pathway is .89mts in east west and .59mts in north south direction, whereas the same on the south is .75mts in east west and .74mts in north south directions. The side walls in front of the shrine cell extends 1.43mts and .74mts in the bottommost and .62mts and .12mts in the topmost in the north and south respectively. The anterior wall of the sanctum is 2.25mts width, sectioned by four pilasters. An aperture is formed between the middle pilasters to a height of 1.50mts and to a width of .75mts forming the entrance to the sanctum. The space between the pilasters on either side of the sanctum is formed as niches. 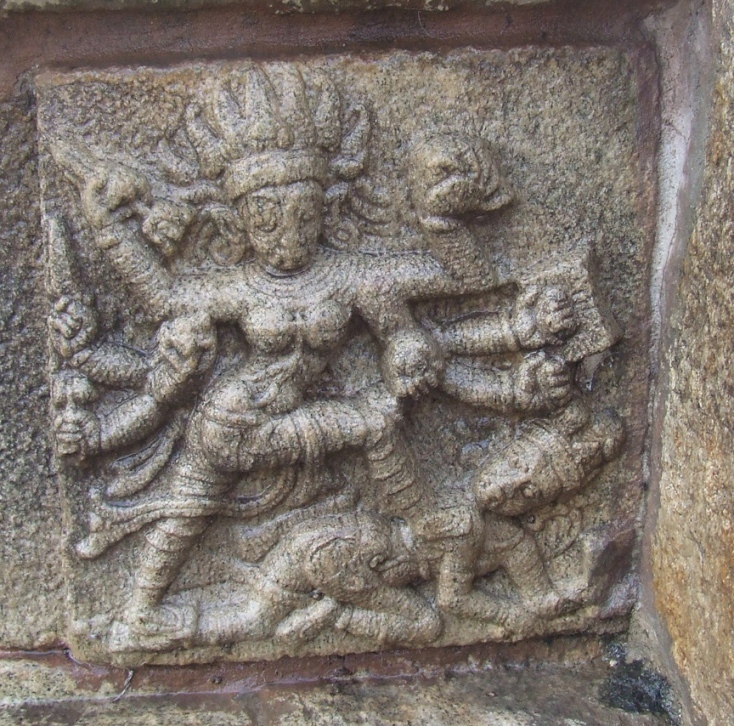 An attempt of adhisthana is seen on either side of the sanctum front wall. Jagati is formed to a height of .43mts and followed by octagonal kumuda and kampa. The pilasters that raise above the kampa are square, kattu, square and the kattu is long comparing the squares. The angular potikas that rest above the pilasters are single limbed extending inside forming a vaulted roof for the niches. 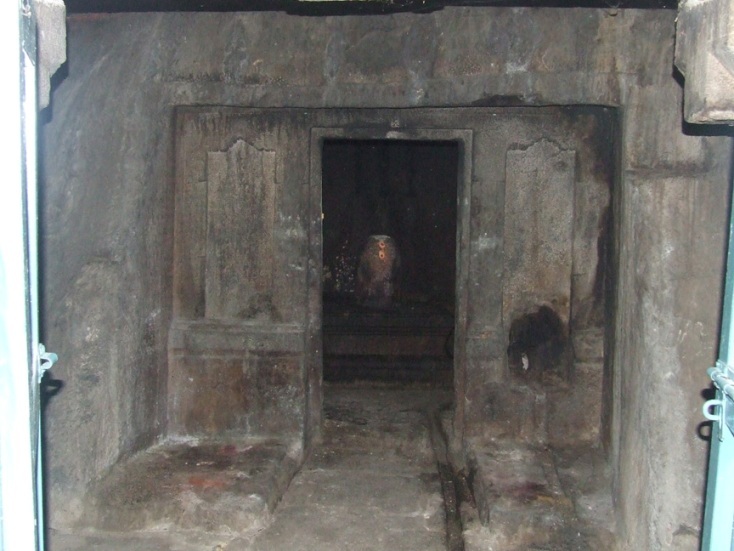 Such narrow vaulted niche is seen in Malayakkoil sanctum wall. Two tarangas are shown at the base and two in the angular section, the intersecting wave is extended as a contour scroll in the face of the potika. The hands of the potikas bear the uttira that run above and a thin vajana buffer the uttira and the roof. The vajana also extends on the sides in the anterior wall. The niche on the south is .94mts height and .36mts width whereas on the east it is 1.31mts in height and .36mts in width. A roof extension in front is .12mts in the south and .57mts in the north forming an uneven kapota for the shrine cell. The canopy is flat and above the kapota the rough rock is trimmed to a height of .13mts forming a ridge at the face of the kapota. On the northern niche a hole is scooped cutting the kumuda, kampa and partly the jagati to create a water outlet and a pathway also follow the outlet in the front extended floor. The cubical shrine cell is 2.35mts in the north-south, 2.32mts in the east-west directions to a height of 1.86mts and houses the rock cut Linga in the center. Both the avudaiyar and bana are rock cut which are .52mts and .53mts in height respectively. The cubical avudaiyar is measuring 1.02mts in its sides with a small gomukha on its east. The avudaiyar is decorated as a padabandha adhistana with the components of jagati, rudra kumuda, kantha flanked by kampa on either side, pattika and upari kampa. The pit formed to collect the abhisekha water is closed at present. Another water outlet is cut on sill which extends on the floor of the mukha mandapa and ends adjoining the northern wall. The temple is rich in inscriptions. 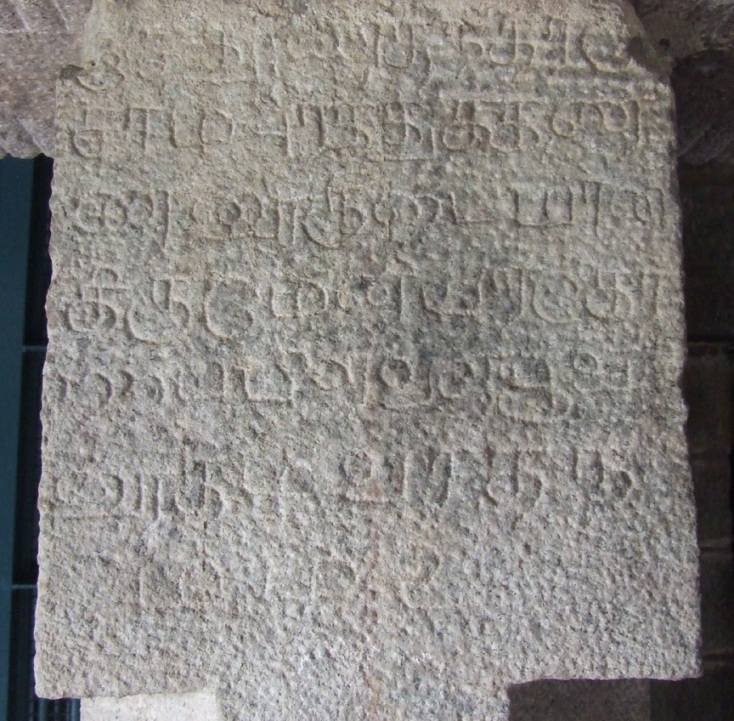 Inscriptions of Muttaraiyars, Cholas, Pandyas and Vijayanagar are found. Besides 15 copied inscriptions10 24 new inscriptions were discovered during the field study.11 The inscription found on the lintel of the rock cut cave authenticates the author of the cave as Amarundri Muttaraiya alias Bhudi Kalari and the period of the cave as 8th century A.D. 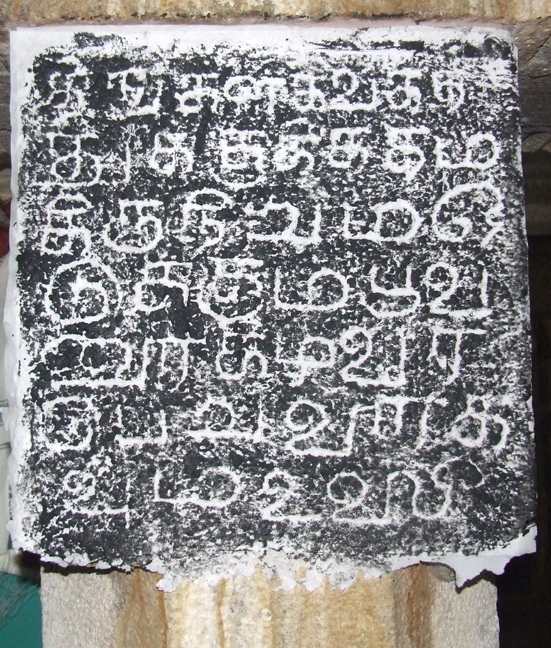 The inscriptions also picture Poovalaikkudi as a great socio-religious centre, the authorities of the temple and the village settling dispute which created great havoc to the neighbouring region. 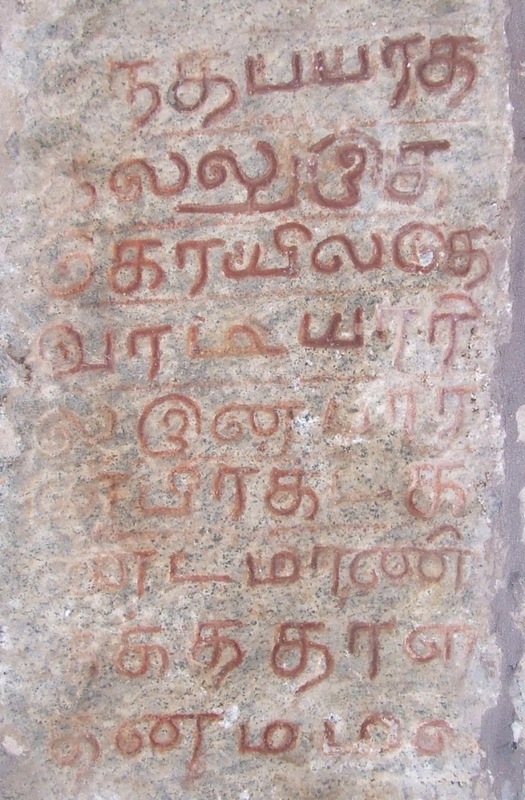 One of the inscription speaks about the appointment of Devaradiyar to the temple. Another interesting aspect to note in this temple is, the shrines, the entrances, pillars, potikas and roof slabs possess details of its sponsors. It is exciting to note that all the lintels possess inscription of the donor of the entrance which is a unique feature of this rock cut shrine. 1. Field visits on 19-02-2010 and 14-08-2010. 2.	www.earth.google.com 10020' 02.30N 78037' 26.66 E.
3. SII Vol.23 : 142. 4. T.Sumitha, M.Nalini, R.Kalaikkovan, Varalaaru, Vol.21, 'New Inscriptions - Pushpavananathar Koil', Annual Research Journal, Dr. M.Rasamanickanar Centre for Historical Research, Thiruchirappalli., P.25. 5. ibid., the inscription details about the sponsorship of the door frame which consists of lintel and jambs, by one Suryadevar of Kovanur. P.25. 7. ibid., the inscription details about the sponsorship of the door frame by one Pandanai Ilamagan Kuppai Sundaran Seruthimalai Nadalvan. P.25. 8. Raja Mohamad J., Avanam 19, “Pudukkottai Mavatta Kudaivaraikkoilgal”, 2008. 'குன்றின் மேற்கு முகத்தில் விநாயகர் புடைப்புச் சிற்பம் காணப்படுகிறது'. But the Vinayaga is on the southern precipice of the hillock. P.173. 10. IPS : 42, 111, 222, 400, 444, 490, 747, 748, 755, 799, 803, 815, 930. SII Vol. 23 : 142-151.